In the United States rodeos and rodeo-related events are usually opened with the formal presentation of the Flag of the United States of America. The presentation of the American Flag is followed by the playing of the National Anthem. The information below describes the proper way for US citizens within US jurisdictions to show their respect for the American Flag and National Anthem. Below: The United States flag being formally presented at a rodeo arena. It should be noted that while flag and/or national anthem etiquette is federal law as defined by the United States Code, there are no provisions for enforcement. Proper etiquette for the formal presentation of the Flag of the United States of America and the playing of the national anthem is established by the United States Code. All other persons present should face the flag and stand at attention with their right hand over the heart, or if applicable, remove their headdress with their right hand and hold it at the left shoulder, the hand being over the heart. Please note: Removing headdress has not traditionally been applied to women. Please see "Things To Consider #2 - Women and Hats," below. Keep in mind that there is no need to observe the above etiquette if you merely see the flag. 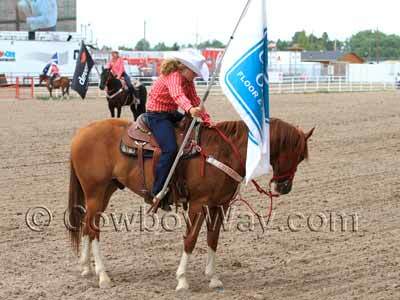 For example, at a rodeo the flag is often carried by a mounted rider. 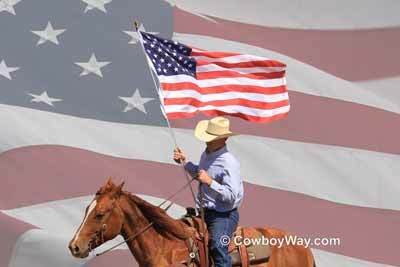 If the rider should carry the flag into the arena during a warm-up period prior to the rodeo there is no need to stand at attention and/or salute. However, when the flag is formally introduced and passes by, rules of proper etiquette and respect apply. While the United States Code does describe the removal of "headdress," or hats, as proper etiquette for the formal presentation of the flag and the playing of the national anthem, this stipulation has not traditionally been applied to women. This is possibly because at the time the Code went into effect (1923) the vast majority of women's hats were 1) formal, and/or 2) difficult and time consuming to remove and put back on. Today, though, with the popularity of casual, unisex hats among women that are easily removed and put back on (such as a cowboy hat or ball cap) some women voluntarily remove their hat for the presentation of the flag and/or the playing of the national anthem. To address this issue some, but not all, current hat etiquette guides recommend that a woman continue to wear a formal hat or a hat that is difficult to remove and put back on, but also recommend that a woman remove a casual, unisex-type hat. However, many people have been instructed in the traditional understanding of the Code whereby a woman is not expected to remove her hat during the presentation of the flag and/or the playing of the national anthem. Therefore, to the best our knowledge, a woman should not automatically be considered to be disrespectful if she leaves her hat on during these times. She may simply have been instructed in the traditional understanding of the Code. Below: The national anthem being played at a women's ranch rodeo. In the background you can see many of the women have chosen to remove their hats, but at least one has not. It is worth mentioning that during the formal presentation of the flag and the national anthem that not all "headdress" is the type that needs to be removed. For example, religious headdress has traditionally been considered an exception and may be left on. While there are not any formal guidelines that we are aware of, there are, or seem to be, a few exceptions to removing hats and/or placing hands over hearts for people who are working. For example, a United States flag is often presented in a darkened rodeo arena with a moving spotlight on the flag. The worker who is running the spotlight is not considered disrespectful if he or she cannot observe proper etiquette because they are busy operating the spotlight. Other exceptions might include a photographer who is photographing the event, and stock contractors and others working with livestock who are not able to pause in their work. Other exceptions may also apply. We gave the "short version" of proper United States flag and National Anthem Etiquette above. Below we quote the Code so, if you like, you can read it for yourself. "During the ceremony of hoisting or lowering the flag or when the flag is passing in a parade or in review, all persons present in uniform should render the military salute. Members of the Armed Forces and veterans who are present but not in uniform may render the military salute. All other persons present should face the flag and stand at attention with their right hand over the heart, or if applicable, remove their headdress with their right hand and hold it at the left shoulder, the hand being over the heart. Citizens of other countries present should stand at attention. All such conduct toward the flag in a moving column should be rendered at the moment the flag passes." "1. Designation. — The composition consisting of the words and music known as the Star-Spangled Banner is the national anthem. 2. when the flag is not displayed, all present should face toward the music and act in the same manner they would if the flag were displayed." At most rodeos, the rodeo announcer will probably politely remind you of when to stand and pay respect to the flag, and to remain standing during the national anthem. The announcer will likely not be overly specific as to the other guidelines of respect as contained in the United States Code (given above), so you should know these guidelines for yourself. A rodeo announcer may also remind people to "remove cover," which is another way of reminding you to remove your hat. In addition to exceptions for people who are working, there are some additional common sense exceptions to the Code for some other people. For example, mounted flag carriers are generally considered exempt from removing their hats and/or placing their hands over their hearts because their hands are busy with riding their horses. Other exceptions may also apply. While some exceptions apply to mounted flag carriers, they have other guidelines of respect for our country to follow. For example, a mounted rider carrying the American flag (as opposed to a state flag or some other flag) should never follow another flag, but instead always lead any other flags that may be present. In addition, a rider carrying the American flag should never dip the American flag, but other flags may be dipped in respect for the American flag. Mounted Drill Team Flag Protocol. Western States Equestrian Drill Team Association flag protocol. Below: At the Cheyenne Frontier Days Rodeo, a member of the Cheyenne Dandies Drill Team dips her sponsorship flag in respect as the United States flag enters the arena. Many rodeos will introduce the American flag and another flag (usually a state flag) in a manner called "posting the colors." When the colors are posted two riders enter the arena, each one carrying a flag, lope down opposite sides of the arena, cross at the back, then lope back up the sides and stop. It’s usually a matter of pride to post the colors at top speed (often called “rodeo style”) so most of the time the riders are running all out, or close to it, when they cross at the back of the arena. Here at CowboyWay.com we're retired rodeo stock contractors, and some of the worst arena wrecks we have seen have happened at the moment when two flag carriers cross at the end of the arena. Many riders don't discuss beforehand which one of them will cross on the inside of the arena, and which one will cross on the outside. Galloping headlong at one another leaves little time to guess what the other rider is going to do, and if both riders choose the same path terrible collisions can - and have - occurred. 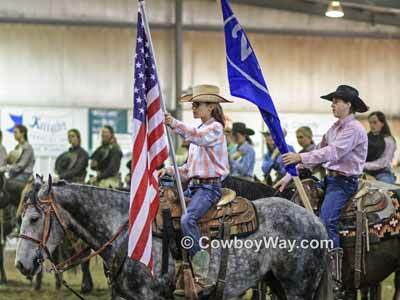 If you ever have the honor of posting the colors at a rodeo, be sure to talk to the other flag carrier and decide beforehand who will ride their horse on the inside when you cross, and who will ride on the outside. It's important to know beforehand, and could save you and your horse from a terrible wreck.